Are Israeli Jews Becoming More Secular? What will the religious makeup of the Jewish population in Israel look like in the coming decades? According to the projections of Israel’s Central Bureau of Statistics (CBS), the Haredi (ultra-Orthodox) population will grow very quickly and compose about 50% of the Jewish population in Israel by 2059. These projections have raised serious concerns regarding the sustainability of the economy given the education and employment patterns of contemporary Haredim. However, there are a number of significant demographic shifts occurring, some of which, it seems, have not been fully accounted for in the CBS forecasts. 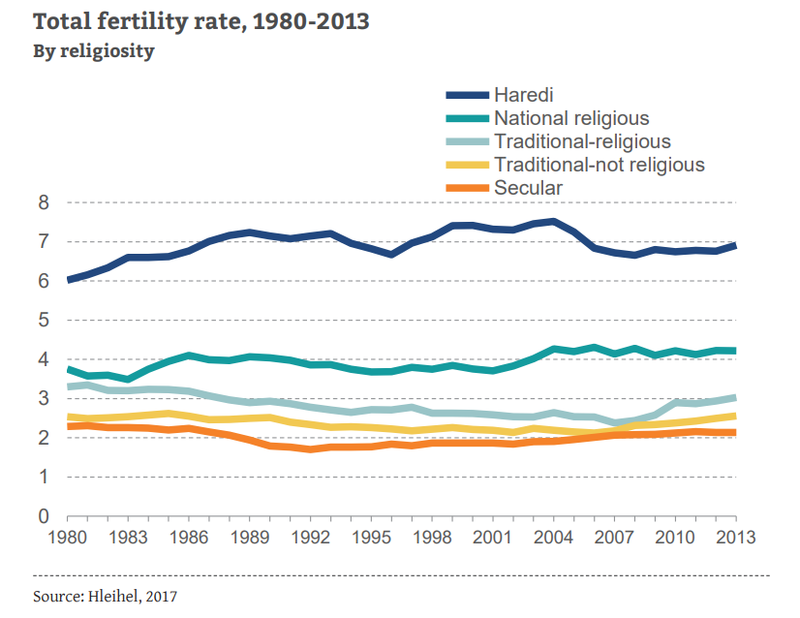 The CBS projections are based on fertility rates – which are much higher among Haredi Jews in Israel than among national religious Jews, and higher among national religious Jews than among traditional and secular Jews. As expected, the number of students enrolled in first grade in the Haredi education stream increased at the fastest rate between 2001 and 2015, in keeping with the high fertility rates in this sector. However, relative to prior fertility, that rate of growth in enrollment was less than expected – 7.5% lower in the 2013-2015 period. Meanwhile, the State-secular education system increased at an annual growth rate of over 2% between 2001 and 2015 – much faster than expected given prior fertility rates in the secular and traditional populations. Between 1st and 8th grade, many more students move toward less religious education streams than in the opposite direction. 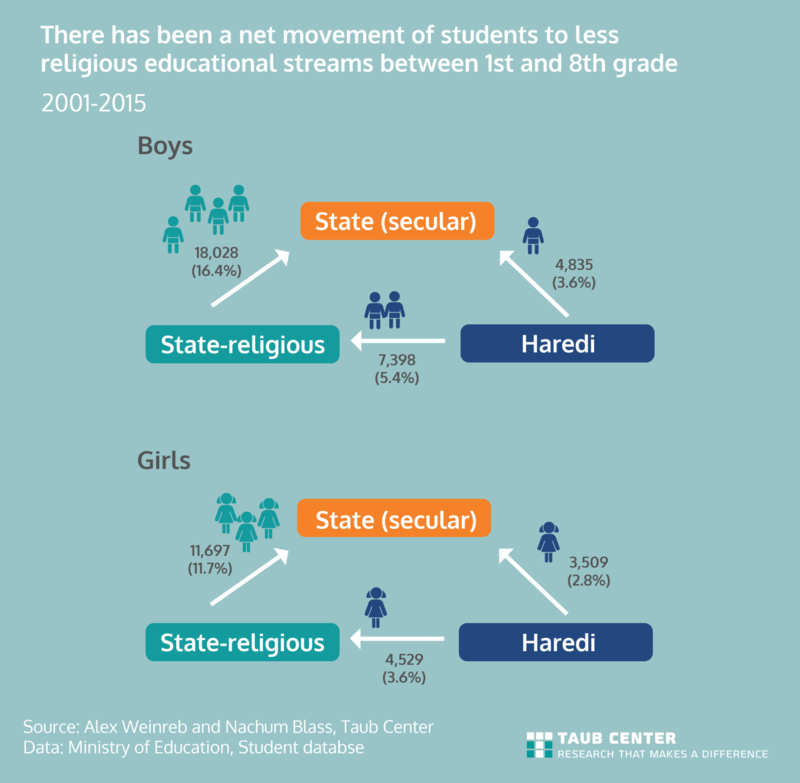 Specifically, between 2001 and 2015, there was a net flow (subtracting transfers in the opposite direction) of 9.0% of boys and 6.4% of girls from Haredi to one of the less religious streams by 8th grade (about 60% to State-religious schools, the rest to State-secular schools). Likewise, there was a net flow of 16.4% of boys and 11.7% of girls away from State-religious schools toward the State-secular education stream. What does all of this tell us about religious mobility? These two findings – the mismatch between prior fertility and 1st grade enrollment, and the net flow of students from more to less religious education frameworks – suggest that, while the Haredi and religious communities in Israel will continue to grow, the pace of growth of these populations is slower than expected. In fact, Weinreb and Blass show that if these trends continue, they will have a significant impact on the future composition of Israeli society. 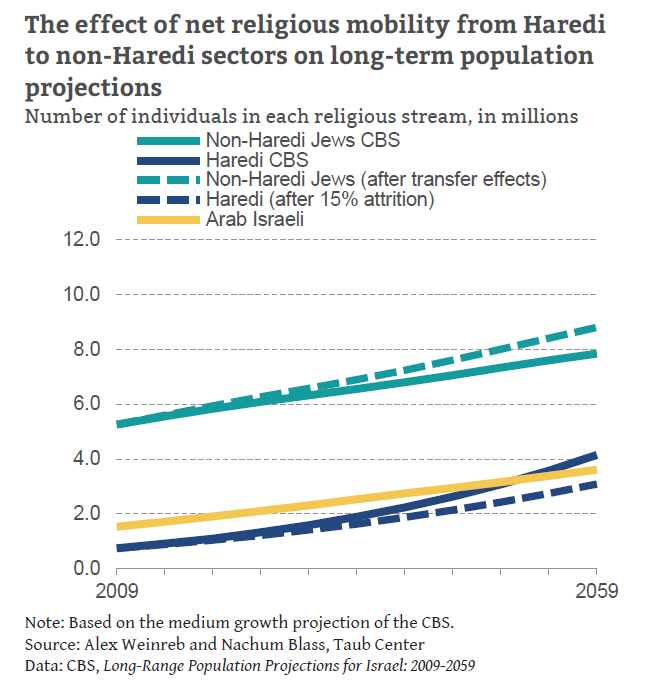 Whereas the CBS projections (the solid lines in the below graph) predict that for every 100 non-Haredi Jews in 2059 there will be about 50 Haredim, taking trends in religious mobility into account (the dotted lines in the graph), suggests there will be closer to 35 Haredim for every 100 non-Haredi Jews. In the meantime, many other changes are taking place in Haredi society, including a rise in the number studying in higher education and a rise in the employment rates. Alongside the trends in religious mobility, these suggest that the effect of demographic changes on Israel’s future economy may not be as extreme as many think.